Place yourself in a bizarre position, as bizarre as some of these symbols: it is America in the late seventies, and a boy, no more than eleven or twelve, is listening, rapt and spellbound, to a voice the like of which he has only heard once before, and even then it was at a distance. 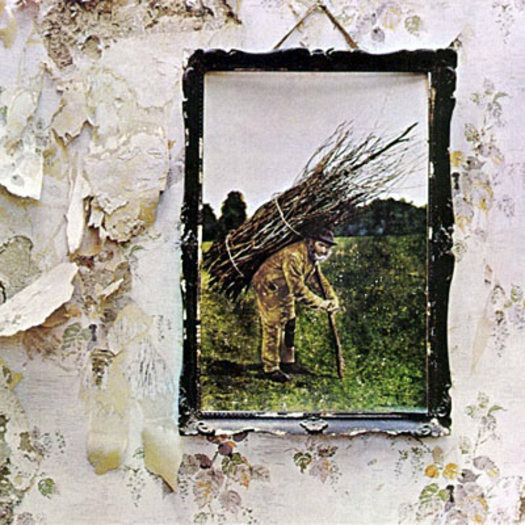 It is not entirely clear whether he is aware that the singer is essentially imitating the boy’s father; he hears the last, Sisyphean “roll” at the end of “Stairway To Heaven,” the escalating abstract voice interplay of “Battle Of Evermore,” or the fourth quarter of “Four Sticks,” and something of that smiling despair stays with him and sticks to him, such that when he eventually turns to making music a decade and a half hence, everyone will compare him to this singer, perhaps more so than the inevitable comparisons with the long-gone father whom he never really knew in the first place. Eventually, and prematurely, he will die, slightly inebriated, up to his waist in an unpredictable river, the destruction wrought by which will be described in the record’s final, climactic song; and in almost his last conscious act on Earth he will be singing one of this man’s songs. The Buckley stories are two things, or two sides of one miraculously tragic thing, but the fourth Zeppelin album is above all else about hearing things rather than seeing things, and the impossibility of believing anything that you see, or in the continued existence of something which might once have been known as “home.” The ancient portrait of a labourer of the soil is tacked to moderately florid, terminally peeling wallpaper, and on the reverse sleeve the camera pans out to reveal, not a rural idyll, but a house in the process of being demolished, giving way to an unspectacular view of a row of similar terraced houses in the process of being knocked down, somewhere in Dudley, in the West Midlands, but dominated by a new, if already grey, tower block. The future will come and swallow you up as mercilessly as the Mississippi if you’re not careful. For most, as 1971 drew to its end, Led Zeppelin were still the most vital present and the most promising future. The group was pressurised by the expectations raised by these promises, but also spurred to become as detached, if still connected, a satellite to the rest of rock as the Beatles had been before them. With the partial exception of Who’s Next, I can’t think of any other number one album from this year which sounds as though it could have been recorded in the eighties – and that isn’t simply down to Bonham’s stairwell beats on “Levee,” later to become one of the foundation stones of hip hop. The production is as free of mud as the musicians’ minds are full of it; everything is crystal clear, even the variegated channel-swapping activities of “Levee”’s climax. They were all around us, yet they also strove to be as absent from us as possible; Jimmy Page had been stung by the muted critical reaction to Led Zeppelin III and was determined to present the blankest of templates; no group credits, no easily graspable title (Led Zeppelin IV and Four Symbols became the most popular aliases) – here is some music, and it doesn’t really matter who made it, even though you know damn well who it is (that having been said, the determined anonymity may have wrongfooted some initial buyers in the States, and the record sat at number two for a month without ever reaching the top, although it has since comfortably become the best-selling album in the US never to make number one). But what is the record saying? Quite a lot of things, and not every one of them is compatible with others. “Black Dog,” for instance, is a most defiant album opener, sounding so relaxed in its post-Hendrix priaptic swoon that it’s easy to overlook just how tricky the song is to play, both harmonically and rhythmically; in its own way, it’s a glove thrust down at the gym-shoed feet of any lousy bar band who think they can do Zep. Its confidence is absolute – Bonham’s cowbell chiming in at precisely the right hip-urging moment, the circuitous dervishes of multiple Plants (with his repeated quatrains of “uh!”s), until the song reaches its turnaround and neither guitar nor rhythm sound remotely grounded; the spectre is almost that of what would twenty or so years hence come to be known as shoegazing, guitars playing virtually by themselves, everything ascending into weightlessness rather than being ground down by gravity (even with the gravest of rock drummers at the helm). This urge, however, isn’t quite spent or fully expectant in its thrust. “Rock And Roll” is the greatest tribute anyone could have expected in 1971; from Bonham’s “Keep A-Knocking” drum rushes – he sounds as though bashing the biggest drum kit in the world - through Page’s Berry recitations (and subtle if speeded and pitched-up quotations from Link Wray’s “Rumble”) to Plant’s righteous holler – so reminiscent of his Wolverhampton contemporary Noddy Holder – demanding to be carried back home, to the world of “The Stroll” and “Book Of Love,” although he knows that recapturing such a world is as forlornly foolish as expecting that ancient hop-gatherer to hop again, his echoing “Been a long lonely, lonely, lonely, lonely time”s joining the hurting dots between 1956 Presley and 1970 Lennon – and of course Elvis should have broken down the studio door and demanded to sing this song, but was that ever going to happen? Jones’ piano in the meantime references Little Richard, Jerry Lee, and even (in the final verse) John Cale (see the Stooges’ “I Wanna Be Your Dog”). Finally Bonham proffers one final explosion on his kit – enough to demand that the 2I’s bar be immediately quadrupled in size – and the song ends on a vaguely triumphant A major. Many first-time listeners must have felt excessive relief; here they are, back and doing what they’re best at doing. But then their ears get tripped up again with “Battle Of Evermore,” an almost impenetrable song lyrically, if not emotionally; those with only a casual knowledge of Sandy Denny’s work, with or without Fairport Convention or Fotheringay, would not necessarily be aware of the fervent fountain of passion which she summoned at deceptively regular intervals – her symbiotic musical relationship with the younger Richard Thompson, as demonstrated on Liege And Lief and Unhalfbricking, was as natural a fusion as that of Gilberto and Jobim, or Keith and Julie Tippetts; indeed her performance on “Evermore,” as the stern “Queen Of Light” setting herself against Plant’s “Prince Of Peace” (a Pharaoh Sanders reference in the middle of a Led Zeppelin album! ), conjures up Julie as much as it does the perhaps more immediately relevant reference point of Shirley Collins. They debate about peace and war, about dragon’s flames and sunlight, and their conversation gets more and more animated; the way both Plant and Denny hold and twist their notes is remarkable – Al Cohn and Zoot Sims lost in Hobbitland – and as Denny disappears into the sky, Plant’s “BRING IT BACK!” cries become less and less anchored; electric guitar finally makes its appearance – Page mostly contributing excellent first-time mandolin (used very differently from Every Picture Tells A Story) – and Plant’s voice rams into a processed, unbearable series of screams (remarkably, the Seattle/Vancouver female-powered rock band Heart tackled both “Rock And Roll” and “Evermore” in their early days). Set in a solemn A minor – in explicit contrast to the triumphant A major of “Rock And Roll” – “Stairway” was designed to illustrate just how completely the group could develop the dynamics of a song from missable quietude to inescapable wall of noise. Its procession is admirably patient; the doleful school recorders of John Paul Jones herald a near-tearful vocal from Plant; imagine a Del Shannon gradually being brought to his senses. There’s this lady – well, it was 1971 – busy buying things, all things she will most likely use once or never at all, and thinking that consumerism will make her unlike all the rest, a shallow notion of “special” which will render her happier than the humblest uncomplaining ploughman. Plant’s voice is full of compassion rather than sarcastic blasts – picture how, for instance, Jagger would have addressed a similar subject matter – and the music systematically moves up and amplifies with him as he urges the return to nature, albeit with caution; his repeated “it makes me wonder” – eventually upgrading to “really makes me wonder” – suggests a root bafflement; why would she not look to the “eastern glow” and glean the opposite of what the singer sees when he looks “to the west”; are those rings of smoke visible through the trees the warning or the aftermath of the battle implied in “Evermore” (“The pain of war cannot exceed the woe of aftermath”)? The new day, however, is anticipated rather than dreaded; the question is, will she follow or misunderstand the “sign on the wall” (that picture, that worker, as the house collapses) – “sometimes words have two meanings”? The music, meanwhile, is brimming upward, Jones’ subtle electric piano blending with Page’s treated guitars to create a Traffic-type rustic groove. As Bonham’s drums enter the picture, Plant sings of “two paths” and, rather more ominously, of “a bustle in your hedgerow” which could be the May Queen or the first sign of an impending disaster, hitting the middle of complacent suburbia (Bonham increases the intensity of his drumming at the signal “stand long”). “There’s still time to change the road you’re on” – and I am reminded of Mingus’ “The Chill Of Death” recitative (from his large-scale 1971 project Let My Children Hear Music) where he picks the wrong road and can’t get back. “Your head is humming and it won’t go – in case you don’t know,” continues Plant. “The piper’s calling you to join him.” Get out of that locked tower and join the real world, which isn’t this one in which we are all marooned. “Oh-hum-hum,” he croons, more agitatedly, and as he points out the true path – that of, or on, the “whispering wind” – his voice hangs on that “wind,” blows it out and stirs it up until it becomes the catalyst for a hurricane; the song’s implicit rage breaks loose, even if it’s not really rage but rather revelation: “There walks a lady we all know” – not the same lady who’s been buying from the stores – “who shines white light and wants to show…” and Plant gives us the signal: “The tune will come to you at last/When all is one and one is all/To be a rock and not to roll,” with that last “roll” being held, caressed, in its place; realise what you really want and need, stay here, the song stops, Plant sings the key line, once more, alone, now smiling. It’s not too late for you, or the environment (this is 1971). Not just yet. Side two lightens the load, or at least pretends that it does; “Misty Mountain Hop” is a funky frolic, mostly driven by Jones’ steadfast Fender Rhodes and an amiably insistent three-note riff. We are back to the blues, or at least Plant is back in 1967, hanging out with the hippies, getting high, the policeman as useless as Dixon Of Dock Green, and it all looks fine, until he turns to his sceptical partner and exclaims: “There you sit, sitting spare like a book on a shelf rustin’,” going on to demand, “You better open your eyes,” his subsequent “WOAH WOAH YEAH” demonstrating that his request is rather more urgent than that of similar entreaties from fellow Midlanders the Moodies. As a delicately strident strut its latent power is only really approached by peak period Faces, and Supertramp built an entire career out of the bridge alone. Still, Plant reveals himself as not bereft of scepticism (the mocking “really don’t care, really don’t care” roundelay playground chant); he eventually takes off for “Misty Mountain” but confesses, “I really don’t know.” Isn’t he just going to run straight into a mirror? He disappears, via Bonham’s huge riverruns of drums, into echoed oblivion. “Four Sticks” is a surprisingly, or not so surprisingly, agonised incineration of a torch song, mainly built to feature the titular accessories of Bonham, stoking a 5/4 hurricane; again there is that recurrent theme of red (“Eyes that shine burning red” from “Black Dog”), but now it’s the river that’s red, and the golden oldies recollections (“It’s cryin’ time,” “When the pines begin to cry”) are far more forlorn than those of “Rock And Roll.” Plant explodes, sometimes like Janis Joplin, at others like Little Jimmy Scott, about rivers running dry and the rainbow’s end (see also Richard Thompson’s not entirely unrelated “End Of The Rainbow” from 1974). Finally (“Who hide their love to depths of life and ruin dreams that we all knew so – BABE!”) Plant has to resort to Starsailor ululations. Plant does “Going To California” as a Joni Mitchell tribute – complete with Joni-impersonating vocals – and once more (alongside the band, playing acoustically in White Album fashion - we find him attempting to escape both the sixties (“flowers in her hair”) and find something deeper, elsewhere than where he is. So he goes to California, and presumably to Joni (who at this time has released the burnished, bruised Blue), but then is this really the paradise that he wants? No sooner has he got there than the earthquake happens – and it did happen, in Los Angeles in February 1971; the band were there at the time, as was my wife, then aged four, and the event is referenced to, sonically, near the beginning of Escalator Over The Hill - and Plant reels back, as outraged as Kenneth Williams: “Seems that the wrath of the Gods got a PUNCH on the NOSE!” He ends the song standing on the Hollywood Hills, as far removed from “home” as ever – “Telling myself it’s not as hard, hard, hard as it seems.” Even in “ideal places” there is trouble in store. But trouble? It’s been storing up the whole album long, and “When The Levee Breaks” – revealing itself, as it does, as the intended partner of “Stairway” – lets it all flood out, summing up the record’s themes of displacement and restlessness (what does the world mean if it’s nothing, and what do we dare do in it, or to it?). It feels like the most cleansing of rains, and a notable step-up, in both intensity and intent, from the Kansas Joe McCoy and Memphis Minnie 1929 original, performed very briskly with McCoy’s no-nonsense vocal trembles, blended with Minnie’s agile single-note runs, about all the disasters which might befall him were the Mississippi to burst, although it had already done that two years previously, thus engineering the mass migration of chiefly black workers to the Midwest and contributing directly to the urbanisation and eventual electrification of the blues. Zeppelin’s take is best heard in combination with Randy Newman’s terminally placid thoughts on “1927” which conclude his Good Old Boys album (well, didn’t the South ask for it, he wonders?). Through its bursting brooks – every hole of the sound picture drenched in phased guitars, Bonham’s dambusting/building drum track, Jones’ furious undertow, Plant’s howls – the song offers no hope of escape or even home (“Don’t it make you feel bad/When you’re tryin’ to find your way home/You don’t know which way to go?”). The riff tumbles and bangs into itself like an Atomic Age pinball machine; even the rhetorical pauses harbour no lifeboat or saviour. Worlds weep and moan and even God appears to have vanished (“Cryin’ won’t help you, prayin’ won’t do you no good”). More even than “Baba O’Riley” or anything else in the 1971 portion of this tale, “Levee” sounds like the end of everything, and the underscoring message is indeed that: forget the sixties, there’s no way back “home,” you have to keep moving or drown, but what if the flood engulfs the whole world? It is ruthless but justified – a lifetime before the Welsh waters, the song demands that everything must go, all the useless baggage, all the store-bought trash, everything that is not you and me and humanity. “Going down, going down now,” Plant wails, sounding as though he is indeed drowning, as the music whirls around him into imperceptibility and abstraction. Drums bark like Zeus’ vilest thunder. Page’s guitar pleads but to no avail. Everything goes out of focus. The last sound we hear is the group, and the planet, vanishing down the plughole of the bath newly bereft of both babies and water. In the gatefold sleeve there is a dark portrait of the Hermit, high on a hill overlooking, by some distance, a city, and civilisation, in darkness, with only his own lamp to lead the way towards – what? His Tarot card identifies the Hermit as a mentor, a guide, someone whose wisdom is likely to lead everyone else who wants it out of darkness. By casting themselves as four separate but connected hermits, Zeppelin set themselves up as guides. In two entries’ time we will see what happened when a levee actually did break, for real, in this age rather than that of the twenties of the rural Southern States. But for now, and for tomorrow if we’re that fortunate, we would do well to remember the name of Plant’s first band, and listen. You never know what the slightest rustle might mean. This was the second album I bought. I was 14 (in 1988). Playing Black Dog loud made me feel ill at first but I couldn't stop playing the whole thing over and over again. I was reading a very appropriate book at the time, The Fionavar Tapestry, which worked with the album's emotion to create a magical experience. I was introduced to punk of various stripes later and "learned" that Led Zeppelin were not cool. I have thankfully dropped that pose. This will always be in my top 3 records of any kind. Thank you for writing such a great review!